Our user experience mind set infuses our design approach for web sites and interactive applications. To us, design is about interaction and visual design. Any framework can be taken to extremes, and the division between visual design and usability experts can lead to bad interaction or just plain unattractive interfaces. Our approach is to balance and blend the natural tension that exists between usability and a pure visual design focus. This flexibility helps us translate your project goals into a simple, effective and visually appealing design. 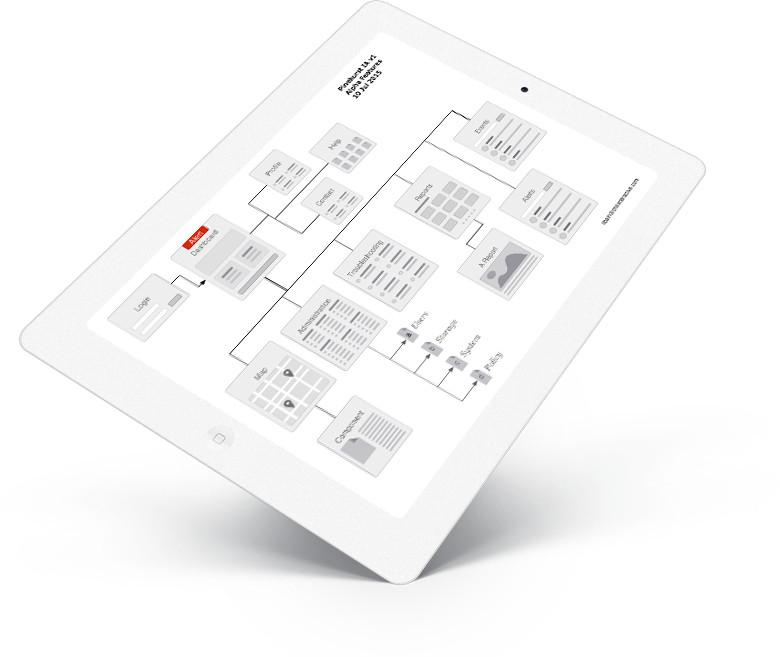 The Information Architecture is the first step in creating a usable, effective design. By breaking down each piece of the project into a visual map of pages, key interaction points, and integrated technologies such as databases, flash, or streaming video, the flow and architecture of the site/application begins to take shape. What are the basic guidelines for how the web site or interactive application functions? Which processes and steps do the audience need to take? We develop the flow for each designated task and account for all functionality so that its consistently implemented across the project..
A wireframe is an illustration of the content, features, and layout of the page or screen that does not include visual design or interactive elements. It is often an early step in the design process and used for discussion because it is easy to change. Often, a prototype is then created to show some or all of the visual design elements and add the interactivity to allow team members and potential users to get a deeper understanding of the user experience. A prototype allows us to examine effectiveness of page layout and content, the flow of the information architecture, and key points for any user interactions. The visual comp is a graphical representation of the look-and-feel of the project, and illustrates how the user interface will be rendered. For most sites/applications, several visual comps will be developed to get a clear idea of the appropriate design direction to go in, and will incorporate branding and other design requirements. We make sure that the visual design will be extensible across all required devices, ensuring your project will always be beautiful no matter where or how it's being used. Every project is different, and we make sure to allow for multiple design comps and iterations until the visual design is perfectly in sync with your needs and requirements. We provide the necessary CSS and image to your engineering team to help ensure that the approved design looks as good live as it does in the design comps. Different teams have different needs for documentation based on the software development model, team communication dynamics, branding guidelines, need for historical documentation, and previous experiences. Good content and writing are key elements to a successful site; yet, they are typically an afterthought in web site and application development. We have experienced partners in marketing, copywriting, legal and privacy issues, and online content development to support these needs.